How do you become a bigger draw than a teammate like Snell who last season owned a league-best 1.89 ERA last year? If you’re Glasnow, you do it by striking out 21 of 64 batters faced, allowing one earned run in three starts and issue just three walks total. That comes out to a 0.53 ERA and 0.824 WHIP in three games. Since giving up a home run to Houston’s Alex Bregman in the first inning of his first start, Glasnow has been Jacob deGrom-like in his dominance, shutting down both the Chicago White Sox and San Francisco Giants on the road. Those may not be the most fearsome lineups in the league, but Glasnow’s arsenal had them as confused as ever. 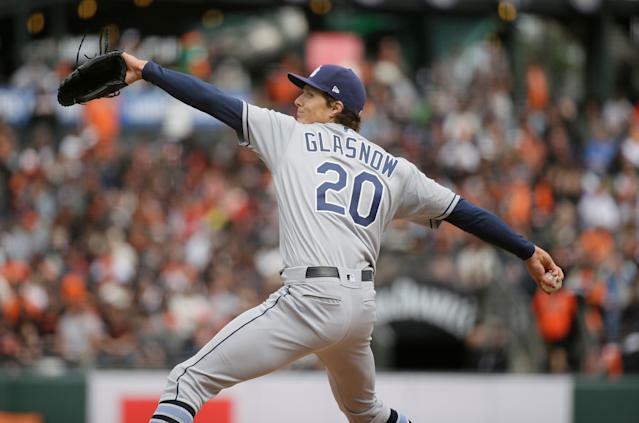 By easing up on his fastball use to start the year (64.8%) and increasing his reliance on his curveball (31.1%), Glasnow has found his knockout combination. That last strikeout sequence had Tim Anderson — MLB’s batting average leader entering Sunday at .444 — completely lost and looking very frustrated. What Glasnow is doing every fifth day, Austin Meadows is doing each at-bat. Through 14 games, Meadows is slashing .385/.467/.788 with six home runs including this moonshot against Toronto on Friday. Look out in the third deck. Meadows has hit more dingers in the first month of the season than he did in 49 games with the Pirates last year (five). It makes you wonder just why the Pirates dealt the two to begin with. “From Pittsburgh’s standpoint, it fills the void atop their rotation following the offseason trade of Gerrit Cole to Houston. Another key for Pittsburgh is control and affordability. Archer is set to make $7.6 million next season, which is quite a bargain for a No. 1 or No. 2 starter. Archer then has team options for $9 million in 2020 and $11 million in 2021, meaning Pittsburgh could retain him for more than three seasons at a great rate even for them. His power game hasn’t developed yet, but Meadows has impressed with his ability to use the entire field and handle both right-handed and left-handed pitching. He figures to be a Rays regular right away. Not even a full year later, it feels safe to say both players have turned the corner. If you’re Pittsburgh, that might be a bit agonizing to handle as the Pirates are off to a 7-6 start in a loaded NL Central. Meadows and Tyler Glasnow have been worth 1.9 WAR together, representing nearly 70% of the Pirates’ team total of 2.8. It’s hard to fault a team that decides to go all-in on a playoff run, and it’s even tougher when you consider that clubs often overvalue their own prospects. Even still, letting Meadows and Glasnow go for a few years of Chris Archer feels like highway robbery by the Rays at the moment. Maybe that changes, maybe it doesn’t. In the meantime, you won’t want to miss this duo continue to dominate the AL East. Blake Schuster is a writer for Yahoo Sports. Have a tip? Email him at blakeschuster@yahoo.com or follow him on Twitter!